Ta robe est magnifique , j’adore le tissus et les boutons vintage me font craquer ! Merci beaucoup! Ah les boutons vintage, toujours une valeur sûre! This dress is too cute! Thank you for giving the great idea how changing the shoulder fit since I‘ve had the same problems. 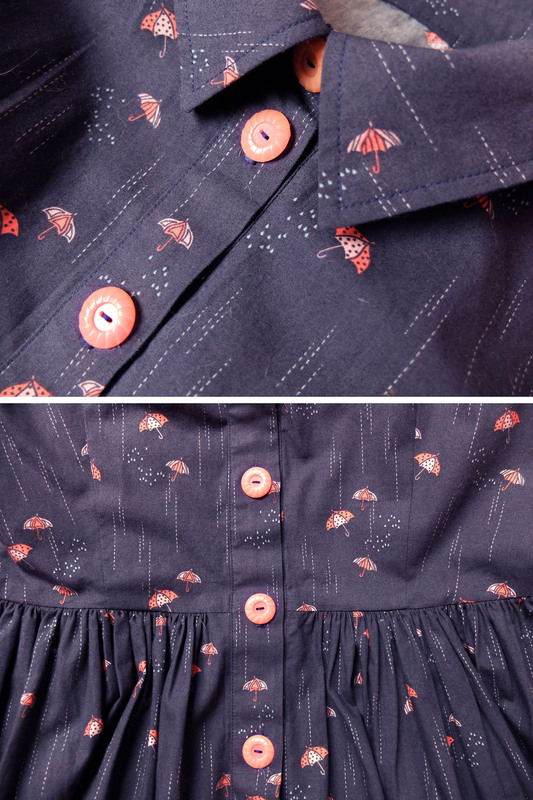 I love the fabric‘s colour and the buttons are complementing the print so well. Thank you so much! I hope you can get a better shoulder fit on any future version! Beautiful. Another great fabric and pattern pairing. Such a lovely idea to create a full button band at the front. It’s a shame you couldn’t see the Lille Braderie, but at least you could enjoy the beauty of the city without it! Such a cute print and those buttons are an absolutely perfect match! I love how the dress looks with a full button band.I sympathise with the shoulder fit as I can never get cotton dresses to fit across mine correctly! It’s something I’d like to work on too. I personally never really know whether it’s my shoulders, my back or the top of my arms that cause those fit problems… I’d tend to think it’s a combination of back and shoulders, but I’m never really sure. Someday I’ll crack that mystery, and you will yours! This is a really lovely dress. Love the full length button band and it’s styled really nicely as well!